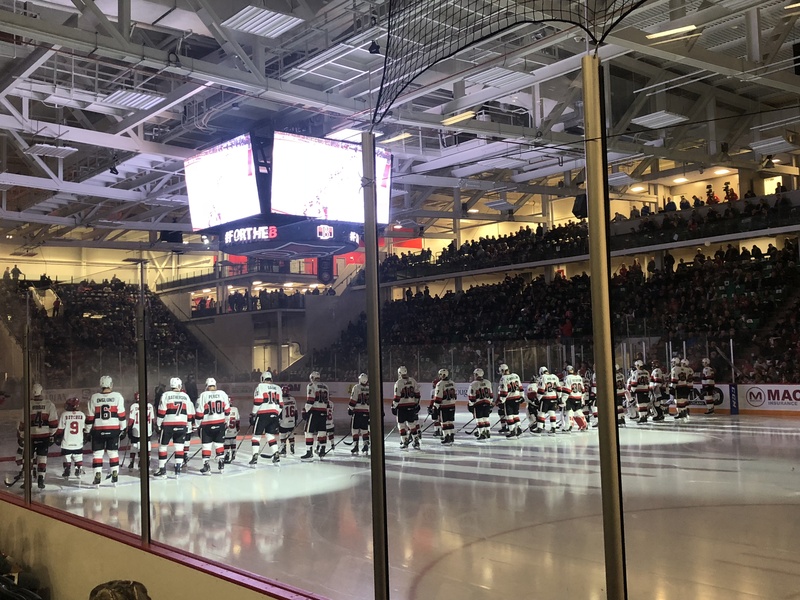 BELLEVILLE – The Belleville Senators opened newly named CAA Arena with a win Wednesday night, beating the Binghamton Devils 5-2 in front of a sell out crowd. The game was highlighted by a stand out performance from the Senators top line of Nick Paul, Drake Batherson and Rudolfs Balcers. One member of line had at least a point on the Sens first four goals and all three players finished with three points on the night. Paul and Batherson were named first and third star of the game respectively. This was the Senators first home game of the season after starting on the road. They lost to the Utica Comets in their season opener Oct. 6. They then split two games last weekend in Manitoba against the Moose. Batherson was coming off a four point performance in their last game in a 6-2 win over Manitoba, and Balcers also contributed two goals in that contest when Belleville forward Filip Chaplik was centring them. Chaplik was out with an injury Wednesday night so Paul was a natural replacement on the line after returning from a short assignment with the Ottawa Senators. “They are just awesome players, hands down. They work really hard, they are the guys here at the end of practice working on their skills, just really easy to step into,” said Paul about his line-mates after the game. Paul was stopped on a break-away in his first shift of the game, but Belleville still built a 3-0 lead going into the first intermission off the contributions from his line. Paul did not let his head coach down as the Senators went to the power-play early in the second period. Paul was able to maintain good control of the puck along the boards before beating his man to get to the centre of the ice and firing a wrist-shot over Binghamton goalie Cam Johnson’s blocker finding the top corner and giving the Sens a 4-0 lead 6:55 into the second. “I think the big boys showed up tonight, which is extremely important when we are missing some of our other key components,” Mann said of his top line making up for missing leading scorer Filip Chaplik. The B-Sens were also missing another recently demoted Ottawa Senator, Christian Jaros, who was a late scratch with flu-like symptoms. Jack Rodewald had the only goal of the night not aided by the help of Paul, Balcers or Batherson. He scored a shorthanded goal in the third to make the game 5-0 at that point. Belleville was heavily outshot in that period though, 19-7. If it wasn’t for the heroics of goaltender, Mike McKenna, the score could have been a lot closer than 5-2. “I don’t know if we got complacent. With this team we are learning how to win, learning how to have fun, learning how to play with one another” said McKenna. ” To ask a full 60 minutes right at the start of the year, is probably asking a little bit, but that’s what we are shooting for and what we want to have going in the future. McKenna, 35, has played in 13 different cities in his AHL career but was playing his first home game in Belleville. “It’s been fun, I mean it’s a great situation. We’ve got a lot of young hungry guys, we’ve got a good core of veteran guys who are here too. The community’s embraced us, you saw it tonight. My daughter is in a great school. Everything has been terrific for us, the coaching staff on down. So I am really excited,” said McKenna of his experience in Belleville. The win moves Belleville’s record to 2-2 on the season. The home opener was the start of a six game home-stand, with two more games this weekend. Belleville will take on the Hartford Wolf Pack on Friday and the Rochester Americans on Saturday. The Senators started the day with a press conference at 3 p.m. held by the team and officials from the Canadian Automobile Association to talk about their new seven year partnership. CAA also hosted a fan festival at 4 p.m. before the game, giving out free hot dogs, drinks and merchandise to fans who were in attendance and donated $5,000 to the opening night’s 50/50 draw which ended up breaking the Senators all-time record finishing at $15,265. Before puck drop the Senators and CAA played a special tribute video to the Belleville Yardmen – who the arena used to be named after. The game was dedicated to the Yardmen and the Senators say they will continue to honour them this season with special events. Tickets are still available for both of Belleville’s games this weekend.